Nutrition is very important for maintaining and/or regaining your health. Because of my experience with Grave’s Disease, as well as being a Chinese medicine doctor, I have a preference for emphasizing natural treatment methods such as diet and lifestyle. Diarrhea is a common symptom of hyperthyroidism. It causes waste to pass through your body too frequently, which can cause an electrolyte imbalance, dehydration, and nutrient deficiencies. Malabsorption can cause a deficiency of essential vitamins, minerals, and nutrients. It is important that you eat nutrient rich foods and that your body absorbs the nutrients from the foods you eat. Vitamins do not require as much energy to digest as minerals (such as iron, magnesium and zinc). If you are low in minerals like iron but you are consuming a lot in your diet, you may have an absorption problem. 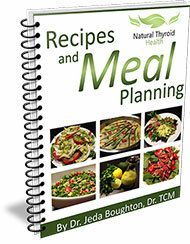 Thyroid and adrenal function is significantly impacted by your blood sugar balance. When your blood sugar is too high, insulin can block binding receptors from other hormones like estrogen and testosterone. When your blood sugar is low, cells become depleted and your hormone balance is thrown off. Keeping your blood sugars balanced helps all of your hormones work in harmony. Your body’s tissue and organs are affected by the nutrients you consume, so it is important to eat the right kinds of foods. Always start your day with a breakfast that consists of 20 – 30 grams of protein with fruit or vegetables. Snacks should also contain protein, good fats, fruit, and vegetables. 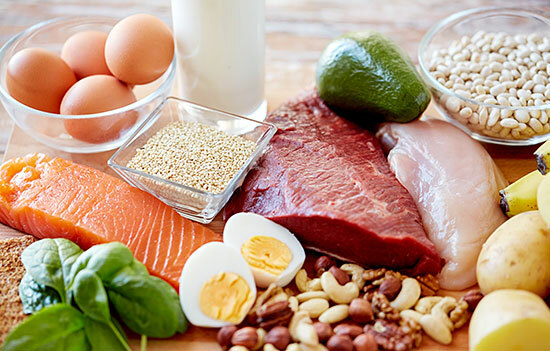 Great sources of protein include: beef, chicken, fish, eggs, beans, lentils, raw nuts and seeds (not including peanuts). Fruit and vegetables to include in your diet include apples, pears, berries, dark leafy greens, squash, yams, avocado, cucumber and celery. Due to soil depletion and the commercial food industry, most people do not consume enough minerals. For that reason, you should consume seafood, kelp, uncontaminated seaweeds, and unrefined salt. Always read labels, mix your own salad dressings, eat unrefined foods without MSG and buy organic foods whenever possible. Remember, for your glands and organs to function optimally, they must be well nourished. Hydration is more important than most people think. The average 150-pound person needs approximately 2 liters of water per day (4 bottles of 16 ounces), and more if you are active. There are many foods that can damage the cells in your body. Limit your consumption of processed foods such as canned meats, sausages, salami and anything in a jar, can or box. Eat most of your meals fresh rather than frozen and avoid preservatives and fried foods. Avoid gluten (the protein in wheat, spelt, barley and kamut) because it instigates and perpetuates autoimmune thyroid disease. A holistic doctor can provide a food allergy panel, which measures your IgG antibodies for certain foods. This test is more specific than the conventional skin prick testing which is very sensitive and often inaccurate. You can also undergo a gastrointestinal health panel which analyzes the health of your gastrointestinal tract. These tests examine stool and saliva specimens. An inexpensive way to determine food allergens is an elimination diet. You start by removing all of the common food allergens such as dairy, soy, gluten, nuts, and eggs. Once you have eliminated these common foods for 3-4 weeks, gradually bring them back one at a time. As a doctor of Traditional Chinese Medicine, I teach my patients the importance of the energetic quality of food and their impact on your body. Everyone has different needs depending on your imbalance. Your symptoms will determine the foods that you should eat. For instance, if you’re having problems with heart burn or weight loss, you may be asked to eat more energetically cooling foods and avoid spicy foods. This approach allows your digestive system to work optimally for your specific condition. Talking to a competent and qualified natural health doctor who specializes in endocrine disorders and can recommend quality supplements, assist you with your diet and help you develop a complete program.